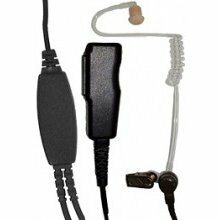 Surveillance Kit: 2-wire clear acoustic tube with soft rubber tip for maximum comfort, robust inline Mic and Palm PTT. 280cm lead. Replacement tubes and tips available for hygiene.